"Rule of Law Challenges in the EU: Implications for EU Economic Law"
The Centre for European Studies (CES) of Faculty of Law and Political Sciences of the Széchenyi István University cordially invites you to the 1st EU Business Law Forum – The Influence and Effects of EU Business Law in the Western Balkans. 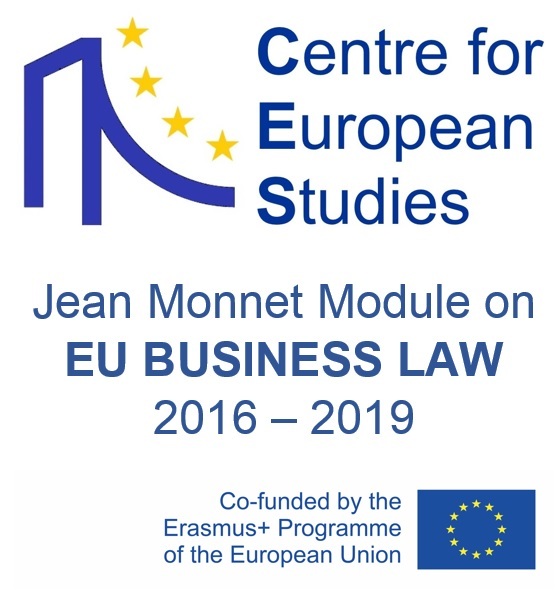 The Forum is part of the ‘Jean Monnet Module on EU Business Law’ (EUBLAW) project funded by the European Commission’s Erasmus+ Programme in the Period of 2016 – 2019. 15 years ago, the Copenhagen European Council closed not only the first phase of the accession of the Central and Eastern European countries, but the Member States opened also a wide window on the future of Western Balkans and laid down the stabilisation and association policy objectives of the European Union towards the countries of the region. The Conclusions of the European Council meeting held in December 2002 confirmed the status of the Western Balkan countries as potential candidates and emphasised its determination to support the efforts of these countries to move closer to the European Union. The Thessaloniki Agenda for the Western Balkans, adopted one year later, assured the full support of the EU Member States to the endeavours of the region to consolidate democracy, stability and to promote economic development as well. The Agenda gave priority to further liberalisation of trade relations and urged the Western Balkan countries to accelerate the momentum of structural reforms, promote good governance and create a business environment that stimulates economic activity and foreign investment. Today the potential candidates have a significant trade relationship with the European Union and their business environment as well as market conditions are progressively becoming more stable and transparent. At this time, the Former Yugoslav Republic of Macedonia, Montenegro and Serbia are already under negotiation for EU membership, but Albania, Bosnia and Herzegovina and Kosovo have also the prospect of joining the negotiations in the future. The accession process is enhanced also by the harmonisation of the legal orders of the potential candidate countries with the framework of the acquis of the European Union. The converging tendency of laws is specifically addressed in the approximation clauses of the Stabilisation and Association Agreements concluded by the Western Balkan countries with the European Union. These standard clauses require the candidate countries to make their existing and future legislation gradually compatible to the EU law and to ensure the proper implementation of these norms. The main purpose of the Forum is to identify the relevant aspects of this process and shed light on its legal, political, economic and social implications. The sessions are devoted to discover specifically the national implementation and certain external aspects of EU Internal Market Law, questions related to dispute resolution models and financing issues of EU commercial transactions. All questions and inquiries regarding the 1st EU Business Law Forum should be sent to ces@sze.hu , the Committee makes every effort to respond all questions as soon as possible. The Forum will be carried out within the premises of the Faculty of Law and Political Sciences of Széchenyi István University (H-9026 Győr, Áldozat u. 12, No. 1. on the map). The University is located in the northern part of the town, within easy walking distance of the city centre. - by local bus lines 11, 19 and 29 from the bus stop “Aradi vertanúk útja” (No. 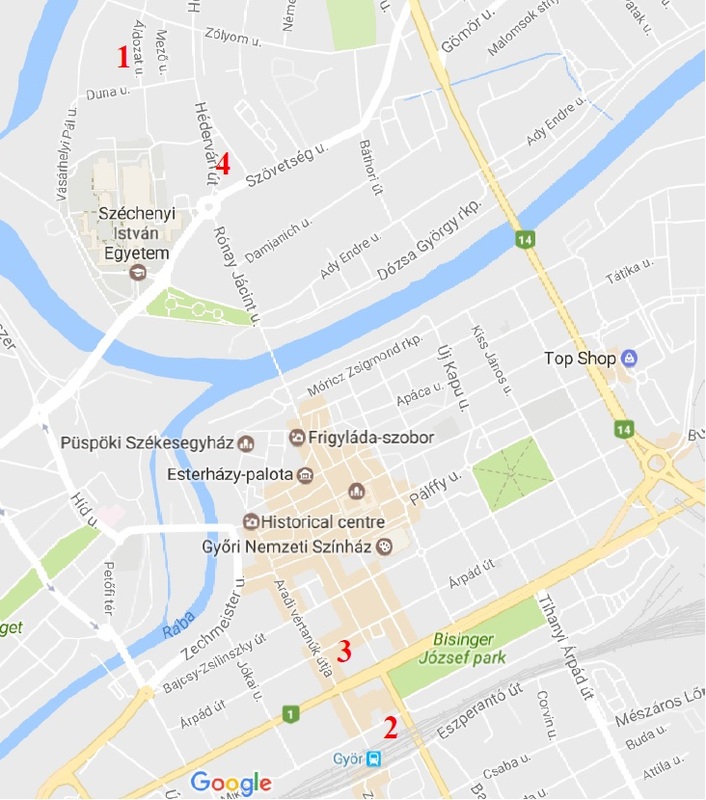 3) to “Széchenyi István Egyetem” (No. 4). Tickets are available in ticket machines for 230 HUF (cash and credit cards are accepted). - by walk (approx. 20-25 minutes). The events of 15th June (Thursday) are hosted by the Révész Hotel (H-9026 Győr, Hédervári út 22., No. 5) The Hotel is easily accessible from the Faculty by a 3-minute walk. The second day of the conference will be held at the Faculty. WIFI internet access will be available in the conference venues. The participants will be invited to dinner reception on 15th June at the Révész Hotel and to lunch reception on 16th June at the Faculty. More information on the Faculty and Győr is available at http://dfk.sze.hu/en_GB/home and http://turizmus.gyor.hu/lang/en/ . © 2019. Széchenyi István Egyetem - All rights reserved.